Customer Service jobs are those that deal directly with a product provider’s customers, whether that’s at the time of sale or afterward. As a Customer Service Representative, you are the first impression that a customer or potential customer will get about the company you’re affiliated with. Your goal is to build a positive relationship with this customer. Therefore, many of the skills employers are looking for are communication-related soft skills. For a Customer Service Representative resume, your reverse-chronological work history should be the focus, with your education history and skills coming in second place. A Customer Service manager resume should include much of the same, with the most relevant job experience given priority. Old advice for including an objective statement on your resume is now way out of date. Instead, the new protocol is to write a professional summary. This is a one- to two-sentence statement that sums up what you most want your potential employers to know. Technically, it’s optional, but writing an unforgettable professional summary will rocket you to the top of the hiring list. You should use it as an opportunity to tell potential employers information about you that doesn’t appear directly on your resume, like your personality traits and/or professional focus. For a Customer Service resume it’s important to emphasize how well you deal with customers, so focus on your interpersonal skills when you’re writing your own professional summary. Trustworthy and empathetic Customer Service Representative accomplished in software troubleshooting and up-selling Premium memberships. Dedicated to keeping excellent customer interaction records. Great Customer Service Representative that wants to get hired by your company today! Of course, your contact information needs to be first and foremost on a customer service resume. If they don’t know your name, your experience won’t matter! Don’t make the mistake of cluttering up your contact info, though—it’s best to stick with the necessities like name, email address, and phone number. Include relevant social media (like LinkedIn) or a personal website if you think it will impress. Don’t link your blog if it has nothing to do with the position you’re applying for. Next, emphasize your work history in your call center or retail customer service resume. This shows that not only do you have training and practice but that you are trustworthy enough for long-term employment. Remember that in Customer Service positions, soft skills are often the most valued, so try your best to quantify your related accomplishments. Customer Service jobs are often entry-level positions, so if your resume is looking a little sparse, you have options to make it more effective. If your work history is spotty or you don’t have a lot of experience, you may elect to put the Skills section foremost on your customer service skills resume. This will de-emphasize your work history and lead potential employers to consider you based on your potential rather than your track record. You can also branch out from a strict definition of “work” and include experience like volunteer work, club membership, and babysitting. Don’t forget academic achievements—they show you are capable and hardworking, even if they’re not directly related to the tasks in the job description. However, be careful not to include irrelevant interests just to fill up space—no one cares that you can knit unless you’re applying at a craft store. Padding your resume is different than presenting it strategically, and it will be obvious to anyone reading your resume. When you’re deciding which skills to include on your customer service resume, it’s best to brainstorm a long list and then cherry-pick the eight to ten most impressive skills. Any more than that and your resume will be cluttered. Remember that if you’re struggling, you can look back at the job description and use words or synonyms for words from that. 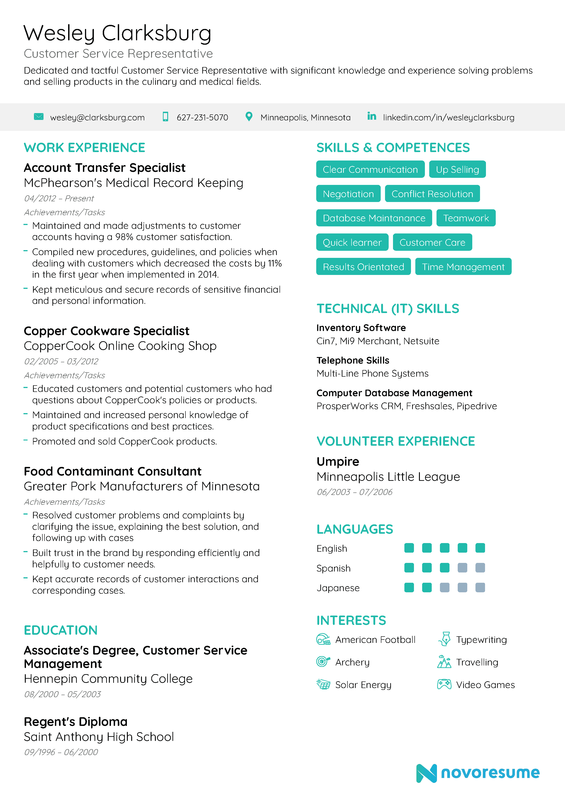 Check out this Customer Service resume skills list! That was a lot of information, but now you’re all set to make a Customer Service resume of your own! Should You Include a Photo on Your Resume in 2019?